At heart, Active Directory is nothing more than a database (a Jet database, to be exact). Big deal, you say? Well, as a matter of fact, it is a big deal: the fact that Active Directory is a database means that you can use scripts to search Active Directory. Need a list of all your user accounts? Write an Active Directory search script. Need a list of all your computer accounts? Write an Active Directory search script. Need a list of all your color printers or all your contacts from the Fabrikam Corporation? Write an Active Directory– well, you know how it goes by now. Of course, it’s one thing to suggest that someone write an Active Directory search script; it’s quite another thing to actually sit down and write that Active Directory search script. That’s not because these scripts are hard to write; it’s because it’s very difficult to find documentation and examples that show you how to write Active Directory search scripts using Windows PowerShell. Well, check that: it used to be very difficult to find documentation and examples that show you how to write Active Directory search scripts using Windows PowerShell. The purpose of this article is straightforward: combined with 100+ sample scripts recently added to the Script Center Script Repository, this article provides an introduction to the fine art of writing Active Directory search scripts using Windows PowerShell. Does this article contain everything you’ll ever need to know about writing Active Directory search scripts? Probably not. But it does include enough information to help you get started. Note. So where can you find more information on writing Active Directory search scripts? Good question. The Scripting Guys did a webcast on searching Active Directory a few years back, and they also put together a two-part Tales From the Script series entitled Dude, Where’s My Printer? Both the webcast and the columns use VBScript in their examples (after all, there was no such thing as PowerShell back in those days), but you still might find some of the “generic” information about Activity Directory (What’s a scope? What’s an attribute? What’s a page size?) to be useful. By the way, these days all the excitement in the PowerShell world revolves around PowerShell 2.0 and the November 2007 Community Technology Preview release. Because of that, we thought it was important to stress that the ability to writes scripts that search Active Directory does not require PowerShell 2.0. All the sample code you’ll see today works equally well on both versions of PowerShell. If you’ve got either version of Windows PowerShell (1.0 or 2.0) installed then you’re ready to write Active Directory search scripts. As you probably guessed, this is the object that actually performs an Active Directory search. What if you didn’t guess that? Well, don’t worry about it; now you know. Why not? Because the SearchRoot property will only accept an instance of the DirectoryEntry class; it won’t accept a string value. Which, needless to say, seems like good enough reason to assign a DirectoryEntry object to SearchRoot. Next we assign the value 1000 to the PageSize property. By default, an Active Directory search returns only 1000 items; if your domain includes 1001 items that last item will not be returned. The way to get around that issue is to assign a value to the PageSize property. When you do that, your search script will return (in this case) the first 1,000 items, pause for a split second, then return the next 1,000. This process will continue until all the items meeting the search criteria have been returned. But, again, we’ll talk about this later. Well, we have a pretty good reason for that: the Filter property won’t accept a SQL query. Instead, we have to assign this property an LDAP search property. But that’s something that – um, that’s right, that’s something we’ll talk about later. Finally, we assign the string Subtree to the SearchScope property. Subtree is the default value for search scripts, which means we didn’t actually have to set the SearchScope to Subtree. Instead, we did this just so we’d have an excuse to discuss the search scope. Limits the search to the base object. The result contains a maximum of one object. Searches the immediate child objects of the base object, excluding the base object. Searches the whole subtree, including the base object and all its child objects. 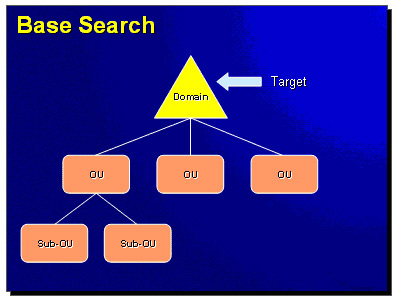 If the scope of a directory search is not specified, a Subtree type of search is performed. Or, set the SearchScope to Base and search just the OU itself, sidestepping any child OUs. $colProplist = "name", "jobTitle", "telephoneNumber"
This, by the way, is standard Windows PowerShell syntax for creating an array of string values: we simply assign each value to the array, enclosing individual values in double quote marks and separating each value by a comma. In other words, if you’re a PowerShell user (and we assume you are), this is something you’ve probably done a million times by now. In the second line, we set up a foreach loop to loop through each of the attributes in $colProplist. For each of these attributes we call the Add method to add the attribute to the DirectorySearcher’s PropertiesToLoad property. The attributes assigned to PropertiesToLoad are the only attributes that will be returned by our search. Suppose we assign name, jobTitle, and telephoneNumber to the PropertiesToLoad property. If we then try to echo back the value of the homeDirectory attribute that will trigger an error; that’s because the homeDirectory attribute won’t be included in the collection of information returned by the script. Note. There is one exception: the ADsPath attribute is always returned by a script, regardless of whether it was added to PropertiesToLoad or not. However, that’s the only exception to this rule. We should probably point out that you don’t have to assign anything to the PropertiesToLoad property; you could simply leave these two lines of code out and you could still conduct a successful search of Active Directory. So why didn’t we just do that and be done with it? Well, if you don’t assign anything to PropertiesToLoad your search script will return all the attribute values for whatever it is you’re searching for. Suppose you have a search script that returns a collection of all the users in your domain. Each Active Directory user account has more than 200 attributes associated with it; if you have several thousand users in your domain that’s going to be a ton of data streaming across your network. In turn, that will: 1) clog up the network; 2) bog down the domain controller performing the search; and 3) slow your script down considerably. If you don’t need all the attribute values then there’s no reason to retrieve all the attribute values. Instead, assign only the attributes you do need to the PropertiesToLoad property. Note. What’s that? You say you really, truly do need to return all the attribute values for all these users? That’s fine; in that case, you should search for just the ADsPath attribute, then use that value to individually bind to each user account and then retrieve the remaining attribute values one-by-one. Believe it or not, that will be faster than returning all these values in a search. Plus, it will save wear and tear on your network, your domain controller, and your sanity. We don’t have time to show you how to do that today, but we’ll cover that in a future article. As you can see, once you’ve configured the DirectorySearcher object actually carrying out a search is as easy as calling the FindAll method. Call that one method in that one line of code and your script will go out, search the requested portion of Active Directory, retrieve the requested attributes for the requested objects, and then store that information in a variable (in this case, a variable named $colResults). 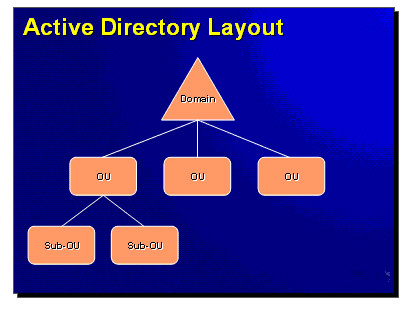 And that’s all you need to know in order to use Windows PowerShell to search Active Directory! Oh, that’s right; we almost forgot. Turns out you still need to know one more thing before you can start writing Active Directory search scripts in Windows PowerShell: you also need to know how to write LDAP search filters. Let’s see if we can figure that out, too. Notice there is no “not equal to” operator (e.g., <>). But don’t worry; before we go we’ll explain how to write a “not equal to” filter. Hey, we’d never forgive ourselves if we didn’t. Why does it fail? You got it: because we used blank spaces to separate the attribute, operator, and value. Don’t be like the Scripting Guys: make sure that you don’t put blank spaces between the attribute, operator, and value. See? These LDAP filters look weird. And to be honest, they are weird. But at least they’re easy enough to write. In this case, we’ll get back all objects where the Department is equal to Finance or where the Department is equal to Research. See the difference? 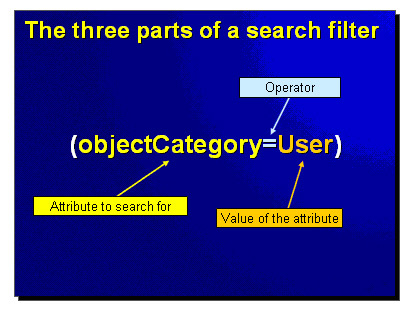 In an AND filter we need to meet all the criteria; in an OR filter we simply need to meet any one of the specified criteria. Don’t feel bad; it is a little confusing, especially at first. But eventually you’ll learn to read and write these LDAP filters almost as easily as you read and write SQL queries. Note. Well, we did say almost. Last, but hardly least, we have the NOT filter. What do you suppose this filter does? For more information, take a peek at the LDAP Filter Syntax on MSDN. Like we said, this isn’t necessarily everything you need to know about writing Active Directory search scripts, but it should be enough to get you started. Let us know if you have additional questions, and we’ll see what we can do about addressing those issues sometime in the near future.